Stunning high spec property with outstanding sea views over Porthminster Beach with parking and only a short stroll of both the beach and St Ives town centre. There are NO RESTRICTIONS for second home/investment buyers. Description St. Eia is a mix of truly exceptional contemporary properties which have been finished to the highest standards throughout. Situated in what is considered to be one of St. Ives' most prestigious areas given the proximity to both the town and Porthminster Beach whilst enjoying some of the most spectacular views of the ocean from all properties. 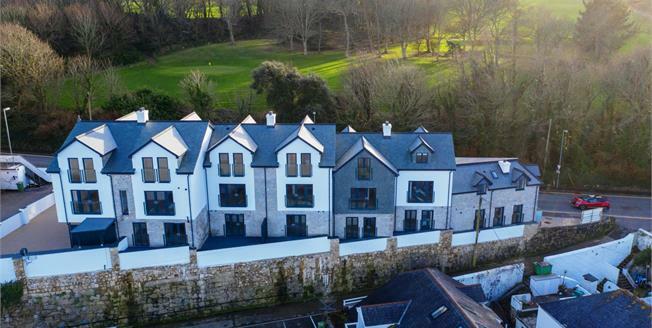 This upmarket newly finished development was one of the last in St Ives to be granted permissions with no second home/holiday home restrictions which is always an advantage in maintaining value in the property should the property be sold in the future. - 1 This is a ground floor single level property with timber flooring throughout. The accommodation consists of two bedrooms with a 'Jack and Jill' style bathroom with access from the master bedroom and hallway. The open plan kitchen/living room is at the rear of the property which enjoys the glorious sea views. The kitchen has been beautifully fitted with high spec German Nolte kitchen units and has Miele appliances. The kitchen blends into the open plan living space to make the most of modern living in this bright and spacious room is flooded with light from windows and doors facing the glorious views. The higher quality theme is no more evident than in the bathroom which has been meticulously designed and finished with designer Villeroy and Boch sanitary ware. - 2 All windows have been well designed with contemporary grey outside and bright white inside and are quality double glazing offering a low maintenance, weather resistant surface which not only looks good but is the perfect material for sea side living. Parking in St Ives is always regarded as a premium and every property has the benefit of an allocated parking space. A short walk from the property is Porthminster Beach meaning a car is not needed for beautiful summers days at the beach. Equally the old town or 'Downalong' is also a stroll from the property and is a maze of cobbled streets, winding passageways and pretty fisherman's cottages offering an eclectic mix of shops, galleries, cafes and gastronomically famous restaurants using locally sourced ingredients. This exceptional development must be viewed internally to fully appreciate not only the standard of the finish but also the outstanding sea vistas. Location St Ives has fast become one of the UK's foremost holiday destinations and offers three award winning sandy beaches. The bay itself was voted by the Daily Mail as the third best bay in the world. The town is a maze of cobbled streets that offers a vast array of high quality restaurants, galleries and shops. Since the arrival of the Tate gallery the season has now become all year round with the artists enjoying the same light that was once enjoyed by artists such as Whistler and Turner. During the summer months the town's population increases dramatically with the beaches awash with colour. is a glorious sandy beach, popular in summer but also providing year round entertainment for surfers. The Tate St. Ives was opened in 1993. As well as permanent displays by local artists including Peter Lanyon, Patrick Herron, Sir Terry Frost and Barbara Hepworth, the gallery has a programme of exhibitions showcasing the work of prominent modern and contemporary artists. Services The following services are available: Mains electricity, mains water supply, mains drainage, gas central heating, and telephone connection although we have not verified this.